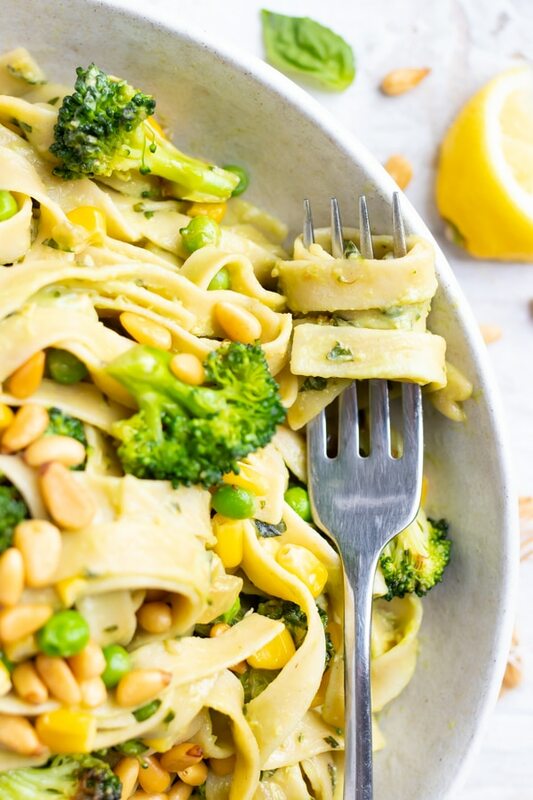 Avocado Pesto Pasta is full of nutritious Spring vegetables and makes a healthy vegan pasta recipe that can be ready in under 30 minutes! 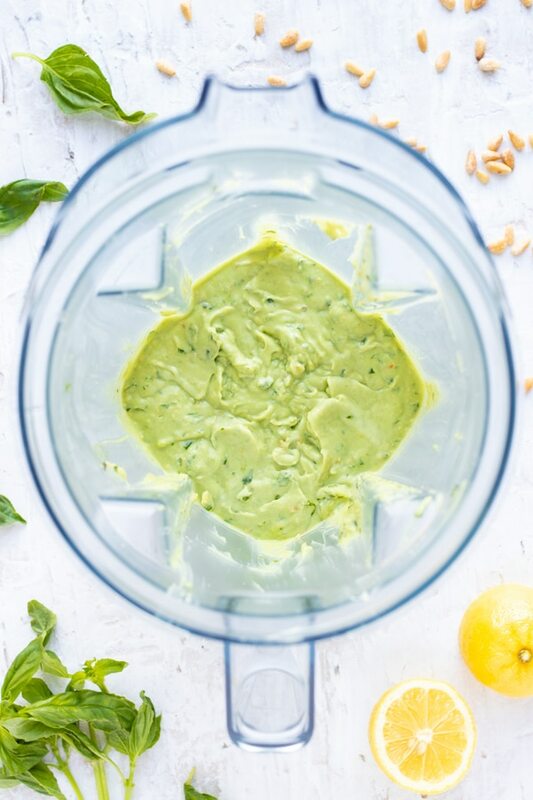 The avocado pasta sauce is a super simple vegan pesto sauce recipe that can be made in a blender, food processor, or Vitamix. Basil is such a fresh and flavorful herb to use in recipes like this avocado pesto pasta. A few other recipes you might like to try include this Basil + Lemon Vinaigrette Dressing, Roasted Tomato Basil Soup (Vegan + Whole30), and a Pasta Pomodoro Sauce recipe. When Cohl and I find a restaurant we love we fall hard and fast and are loyal for a VERY long time. One of our most recent restaurant loves is a quaint little Italian spot on the East side of Austin. If you did not know it was there, you would surely miss it since the Bufalina writing is barely visible from the street. Not only are we loyal to the restaurant, but we also end up ordering the EXACT same dishes every time we go… their margherita pizza and seasonal gnocchi. About every 3-4 months they rotate through different sauces and variations of their gnocchi. My all-time favorite is their Spring rendition. It’s made from a delightful pesto sauce and has bursts of sweetness from petite peas and corn. So like every other restaurant dish I have tried and LOVED, I took this one to the Evolving Table kitchen to recreate a vegan pasta recipe with an avocado pasta sauce. And the results?… A delightful avocado pesto pasta that is gluten-free, dairy-free, can easily be made vegan, and was devoured by my girls at the most recent girls’ night. 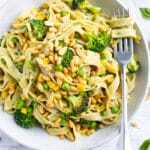 Below you will learn how to make avocado pesto pasta, the ingredients you will need, how to make avocado pesto sauce, whether pasta is vegan, and other vegan pasta recipes you might like to try. This avocado pesto pasta is an easy gluten-free, dairy-free, vegan, and vegetarian pasta recipe that can be made in under 30 minutes. Saute broccoli in a touch of olive oil, add water, and then steam until the broccoli turns a bright green. Remove broccoli from skillet and add additional olive oil and sweet onions. Saute until onions become translucent. 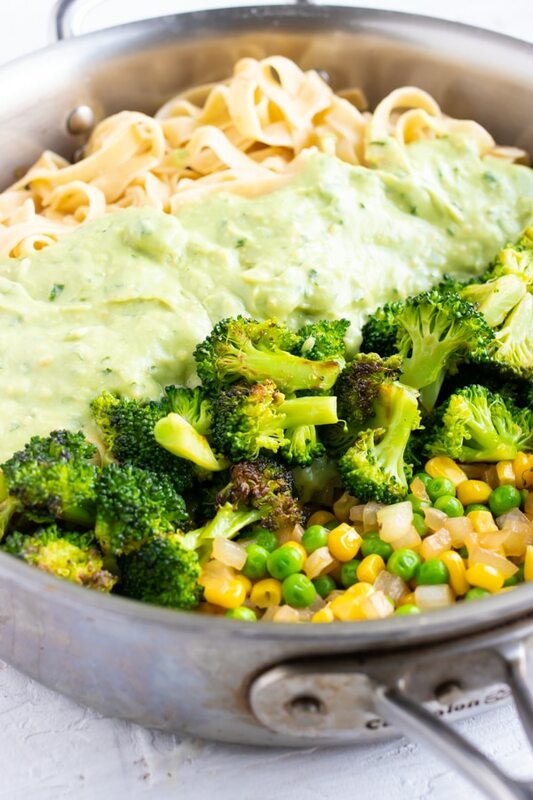 Once pasta and vegetables are done cooking, combine pasta, avocado sauce, broccoli, peas, and corn into the skillet and heat up for 3-4 minutes. 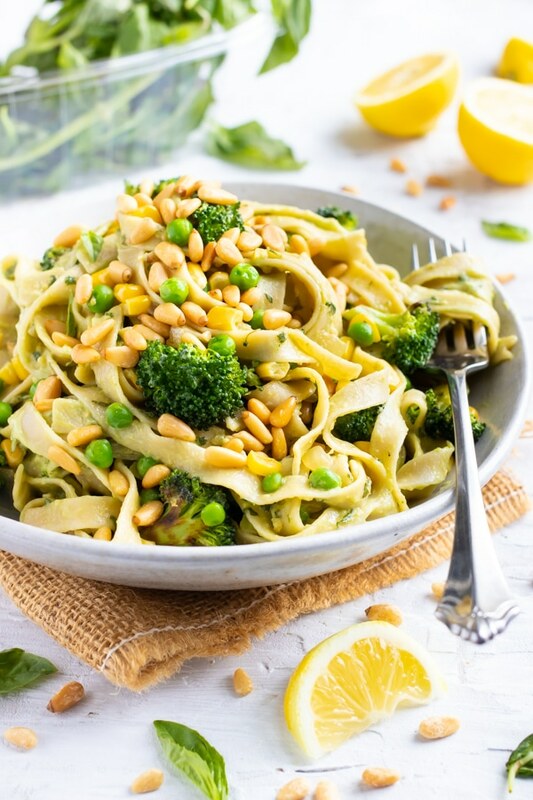 Serve avocado pasta with additional toasted pine nuts and Parmesan cheese or vegan Parmesan cheese and enjoy! 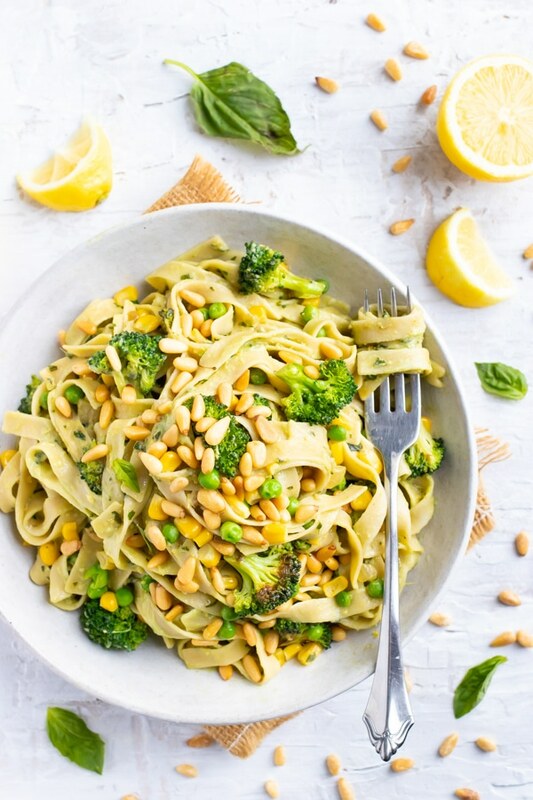 There are a few ingredients you will ABSOLUTELY need to get in order to make this avocado pasta recipe taste incredible, and a few substitutions you can make. Pasta – linguine, tagliatelle, or spaghetti pasta can all be used with similar results. Basil – Absolutely necessary and gives the large majority of the flavor to this vegan pasta dish. Pine Nuts – Yes, these can be a bit pricey, but trust me when I say these play a HUGE role in the incredible flavor of this recipe. Broccoli – While this is my personal preference, you can also substitute asparagus or cauliflower. Peas – Frozen peas work extremely well, but canned peas can also be used. Corn – Try not to leave this out since it gives the pasta recipe a subtle sweetness. This avocado pasta sauce is a rendition of the Vegan Avocado Pesto Recipe that was previously posted here on the site. 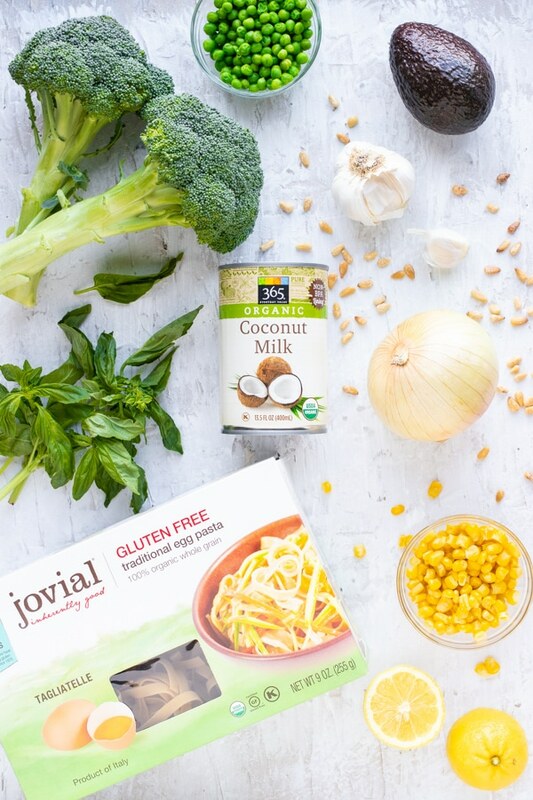 The primary difference is the use of coconut milk in place of the olive oil to make a sauce instead of a pesto. Avocado – Use a small, ripe avocado. You can also use half of a large avocado instead. Basil – One ounce of basil is the absolute minimum. I would not suggest trying to substitute any other fresh herb in this recipe. Pine Nuts – Toasted pine nuts give the pasta sauce a nice and nutty flavor. Please don’t rush and skip this step! Lemon Juice and Zest – The citrus helps to brighten up the avocado pasta sauce. Coconut Milk – Lite coconut milk is used in this recipe but full-fat coconut milk may also be used. I would not recommend substituting regular, soy, almond, or cashew milk in this recipe. Garlic – If you do not have fresh garlic, feel free to use ¼ teaspoon garlic powder instead. 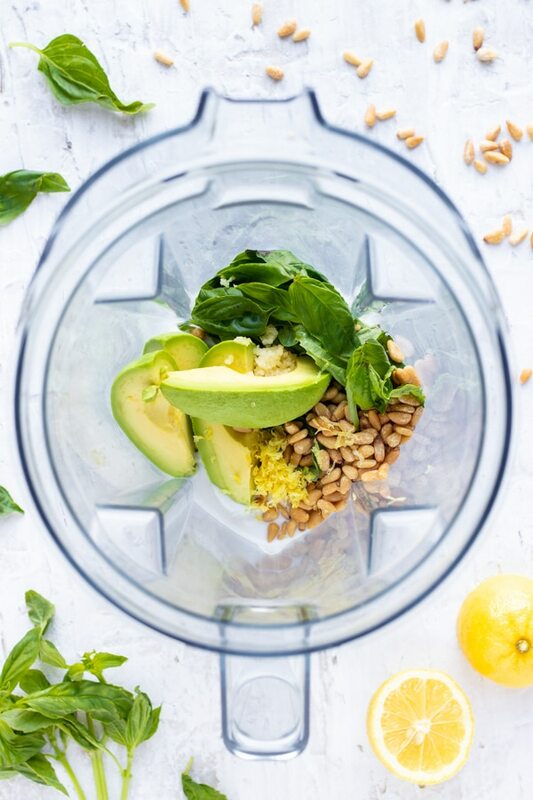 Vitamix – This is my personal preference since it does such an incredible job of blending up the ingredients into a super creamy pesto pasta sauce. Food Processor – Another great choice but it may take a little longer and a few times of scraping the ingredients off the side of the bowl to get the job done. High-Speed Blender (i.e. Nutribullet) – If using a personal-sized high speed blender make sure you use the larger cup so all of the ingredients will fit. While most packaged pasta is considered vegan, not all of it is and you should be sure to read the label carefully. 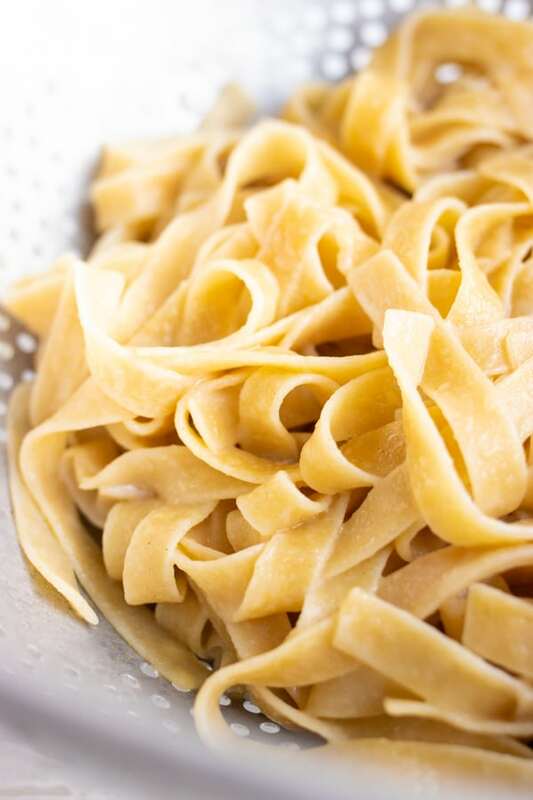 The large majority of pastas only contain flour and water, but eggs are the primary culprit that prevent a particular brand of pasta from being vegan. Please note: The tagliatelle pasta pictured in the ingredients image above does contain eggs and is not considered vegan.